What I want are carbon frame/fork, tall headtube, ISO decoupler front and rear. What models/years should I be looking at? It seems that there have been at least 4 geometries. Are there both rim brake and disc brake options? Do the disc versions have more tire clearance? ...the Domane SL Gravel Disc has clearance for 35c tires and both IsoSpeed decouplers. SLR has front with adjustable rear. SL has front and non adjustable rear. @018 SL 6 Ultegra uses same shifters, and 6800 VS 5800 for 3500.00, has better wheels as well and also 500 OCLV. 2017 has a Disc 6 'S' that is OCLV 400 and uses a seatpost instead of the topmast cap. There are a few of these lower 'S' Domane that are cheaper and review less favorably. The non disc brake SL & SLR use the dual/direct mount brake calipers. The two mount castings come toward tires in and limit tire size/choice at those points. Where as space to the caliper strait up is improved, but moot. I was a bit disappointed when I saw that the SLR-10 RSL tire room [I almost got for $6k - 1/2 price] looked to be 28-30mm actual as the limit I'd say. I had my digi-calipers and got them in by the brake calipers to be more sure what size might fit. I have read the 5800 calipers for rim brake have a little bit more room tires to caliper than the 6800. But question is will the tire hit the rear brake bridge when you get greedy. I run higher tire pressures on My Domane than my Madone, it compensates for the added bouncy/bumpy feel of higher pressures. No front ISO de-coupler, but a Tranz-x anti shock stem in place. BTW, pay attention to the stack and not the headtube length on these. 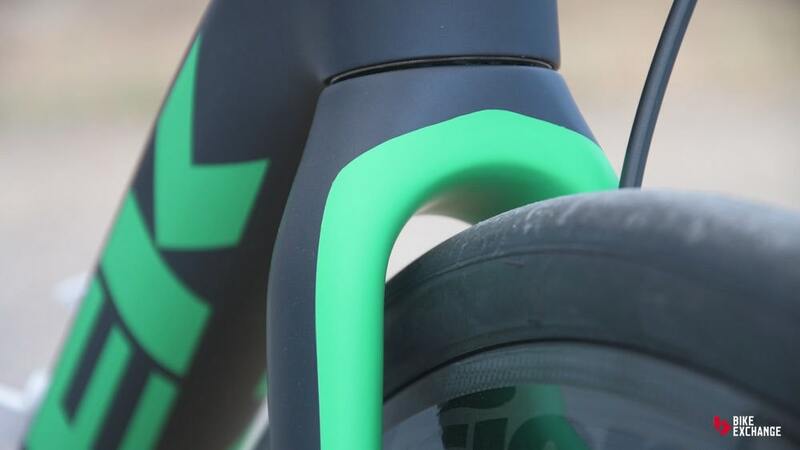 BB is low [7.5-8CM depending on size] , thus the headtube is kinda 1CM taller than a Madone in relation. If you don't want a bike you can't get the bars low enough, watch this. This is why my Domane is a 58 and my Madone a 60. The 60 Domane stack is nosebleed for me. Another point is know what seat mast cap you need so you don't wind up paying for a second one. Make them give it to you when you get the bike. If being a lighter bike is important to you, disc at the sub$4k price point is going to be 2+ lb more than non disc, educated guessing. Searching the Trek site for Domane yields 39 different bikes/frames. What a jungle. A dealer could have 500 in stock with no 2 the same. Is the gravel version new for 2018? I believe the 'Gravel Model is new for 2018. My disc 58 2014 Roubaix was over 20lb with 7800 Dura Ace and XTR/Pacenti/Laser wheels I made personally. Stock wheels on mid level bikes are typically pretty heavy. No surprise. But if it fits 35s, 28 with fender should be a gimme, maybe 32s with fenders? Unfortunately the color choice is dismal, unless you like Matte and Grey. Now is the '2018 gravel' different than the 2017 SL 5 Disc, here is a review pic of the 2017 with a 32 showing lots of room up front. The 2017 is also 2500.00, so if same frame ? maybe better color choice? In the FAQ's on the 2017 sl disc it says 32/s with fenders, so I assume a 35 will fit. may be the same as the gravel? My Madone has the 'Hidden' Fender attachments. There are little allen key in tapped hole on the AL dropout front and rear. And a water bottle type insert in the carbon behind the BB. My Roubaix had similar. I have to say my experience using them on the Roubaix was less than stellar. One of the provided stud mounts when fenders were mounted snapped off flush to the frame on the third day of fendered treking when I hit a less developed stretch of pavment. I submit bumpy unpaved surfaces and the weight of the fenders for the small supports for fenders may be a non starter. It was quite the operation getting the piece left in there without damaging the frame, no less damaging the threads to still use it. New Checkpoint has 45 mm tyre clearance, rear Isospeed and lots of mounts for fenders and racks. Checkpoint looks nice in this color below. The 105 is 2800.00 Add $1k for R8000. BB drop looks massive, but same as Domane. The Domane gravel disc is discontinued and replaced by the checkpoint. Is seems to me SL5 disc may be the best balance of price/ clearance as I think I would want the front decoupled. 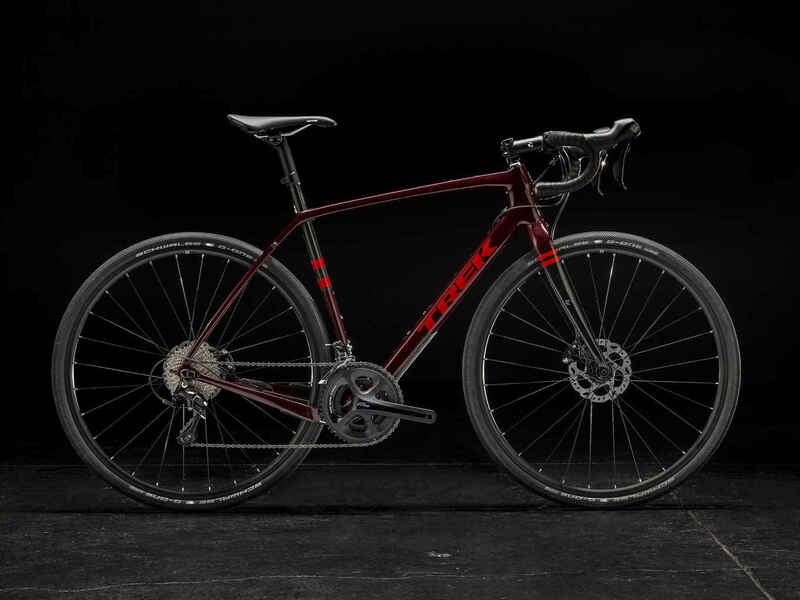 Trek has staggering array of cross/gravel bikes. If disc, 130mm spaced disc rear wheel I believe. Bad idea IMO from the get go. Early adopting has it lack of merits. Not to say you can't re-set the rear to a 135mm rear hub. That bottom bracket drop only looks massive on the Checkpoint because that chainstay runs pretty far below the axis of the bottom bracket. I wonder why they did that. To get more tyre clearance. No chainrings left that are in the way. Opinions on this seatstay dropout union folks? I'm thinking dirt or grease, but without being able to clean it , maybe its a crack? The orange circle looks like grime to me, that red arrow pointing to that space is curious. I wonder what the tire size generosity is on the Porprad. For us guys that ride a 59CM bike I'd hate to get stuck with only running a 33. My first logging road trek on the TCX, first with 33mm CX Ralphs, next weekend 42mm Speed Rides. Huge difference, like sitting 39 ring scrubbing/braking speed down a 5 mile descent with the Ralphs VS out of the saddle big ring sprinting/blasting with the Speed Rides. So if you are north of 90kilo, something to think about. My 06 would fit at least a 38mm tire. What is the Poprad BB drop like?, I do not recall. For gravel use the usual 60-65mm CX drop isn't considered optimum. Having said that, the 65mm drop on the TCX did not cause issues that I recall. And I did enough rough terrain on it that I knew I wanted Carl to build the Green Machine which is 8CM drop. You are more likely to load on a gravel trek than CX bike is made for. 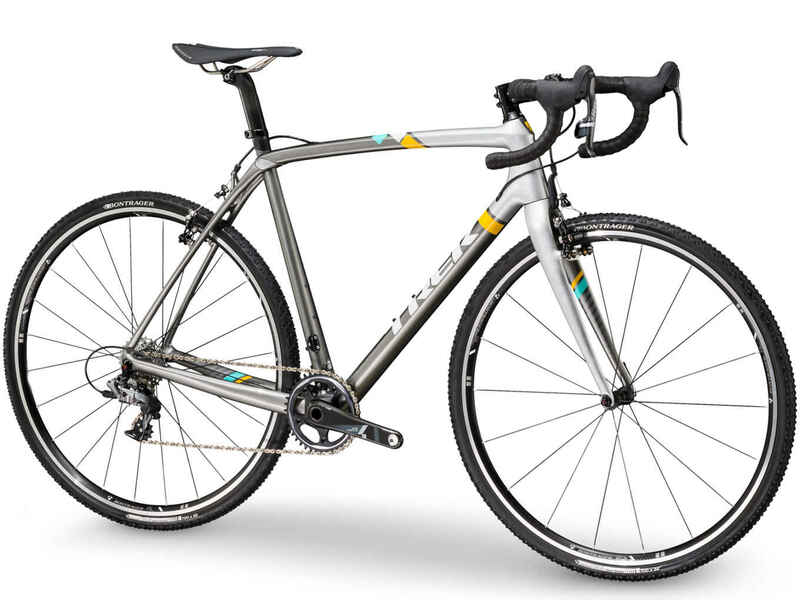 So naked gravel expedition the CX be OK, where-as a long/loaded boondocks camping trek the semi/light touring geom with low BB better suited. Poprad geometry chart claims 74mm bb drop and a 73 head angle. Pretty much perfect geometry in my opinion. "74mm bb drop and a 73 head angle"
Nice, agree that would be a 'like' for me. I am actually not nuts about the 72^ on my Endurance Domane. But Carl seems to have got it more right in feel last disc frame with 72.5. The TCX went to a 55mm BB drop the next year or two after the one I had. The 65mm drop is about the threshold of tolerance for 700c for me. Especially since I use 42 tires on them. Dan, is your Poprad interest for a Swiss army bike? My TCX was exactly, as was my Trek 730 cobble. Both got a lot of off piste use. The TCX with a lot less weight. I'm having trouble understanding why I want it, so theres no way I can explain it. I like Lemond bikes, I like steel, and I like Poprad geometry. I have a Carver custom ti that does all I want,accepts 42/mm tires, rides beautiful, and the Poprad would be redundant. I hope I talk myself out of it. I should get a pure road bike except I don't hardly ride roads anymore and our roads are so beat up its discouraging.